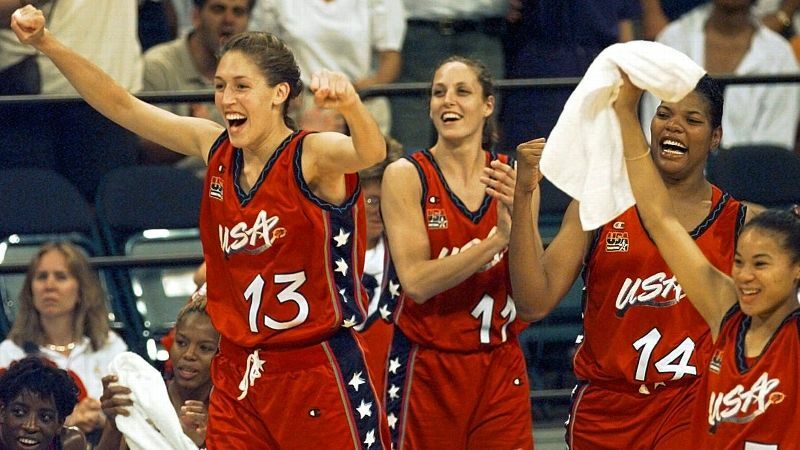 A look at some of the defining moments of the 1996 Olympics. 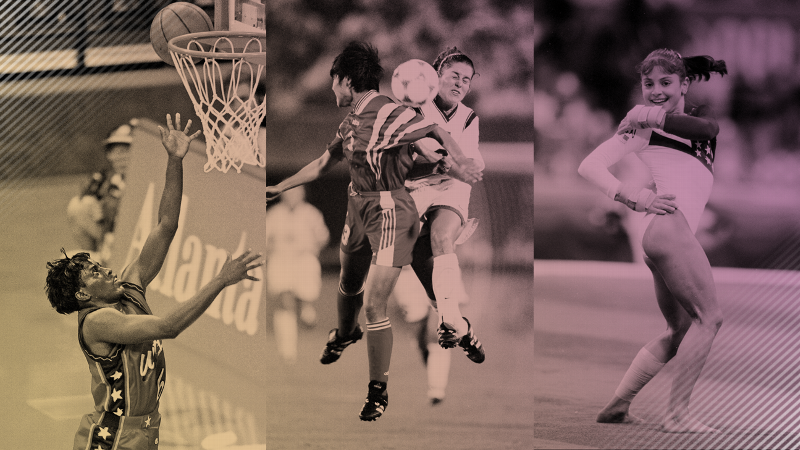 The 1996 Atlanta Olympics marked a change in women's sports that extended far beyond the usual milestones. Sure, the U.S. won the triple crown of team sports -- softball, soccer and basketball -- as well as its first team gold in gymnastics. But female athletes were also being marketed like never before. Sheryl Swoopes had her own Nike shoe, Dot Richardson had a signature bat and female athletes graced billboards and were subjects of TV specials. After the Games, Sports Illustrated and Condé Nast started their own women's sports magazines and four domestic pro leagues launched (fast-pitch softball, soccer and two for hoops). Not all of them survived, but women's sports had clearly arrived. Now, 20 years later, we look back at a few of the moments that made those Games so pivotal, historic and indelible. 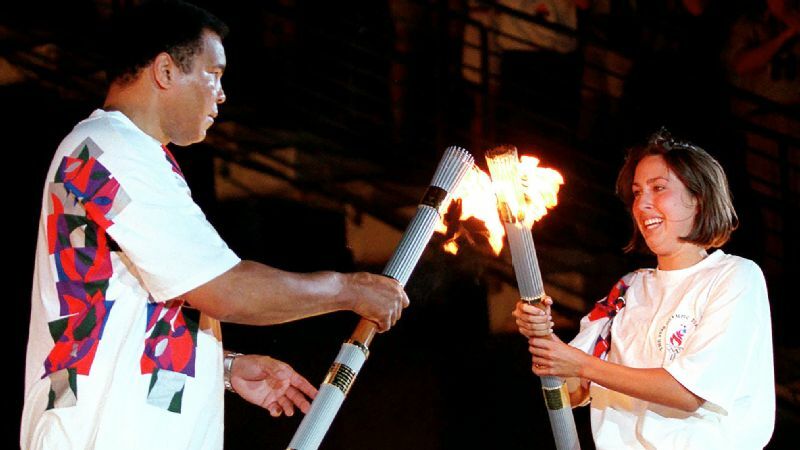 Janet Evans, the penultimate torchbearer, passes the Olympic flame to Muhammad Ali. Despite tremors from Parkinson's, Ali triumphantly lights the cauldron above Centennial Olympic Stadium to open the Games on the 100th anniversary of the first modern Olympics. Evans often says she would give up every one of her five Olympic swimming medals to experience that moment again. "It was that moving," she says. She calls it "the defining moment of my career" upon hearing that Ali died on June 3, 2016. Softball makes its Olympic debut. In the first game of the inaugural tournament, the U.S. routs Puerto Rico 10-0. 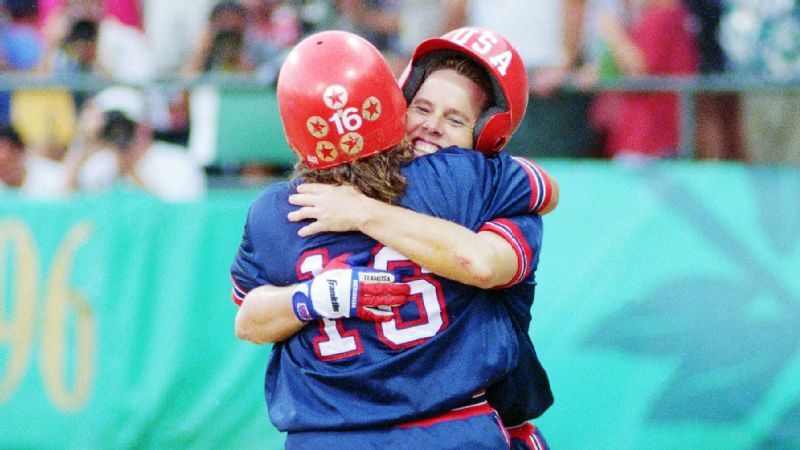 Nine days later, the U.S. beats China for gold, 3-1, after shortstop Dot Richardson hits a two-run homer down the right-field line in the bottom of the third inning. The U.S. goes on to win the next two Olympic gold medals and then the silver in 2008. Softball (and baseball) are cut as Olympic sports after the 2008 Games. 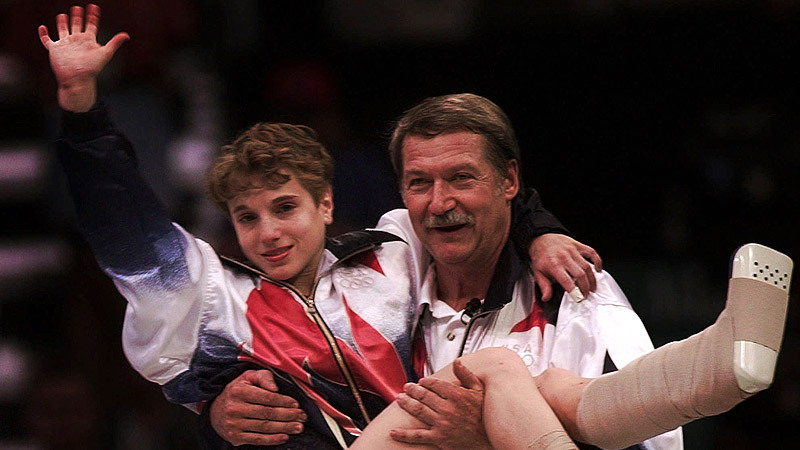 U.S. women's gymnastics wins its first team gold in history and Kerri Strug soars to fame by vaulting on an injured left ankle. 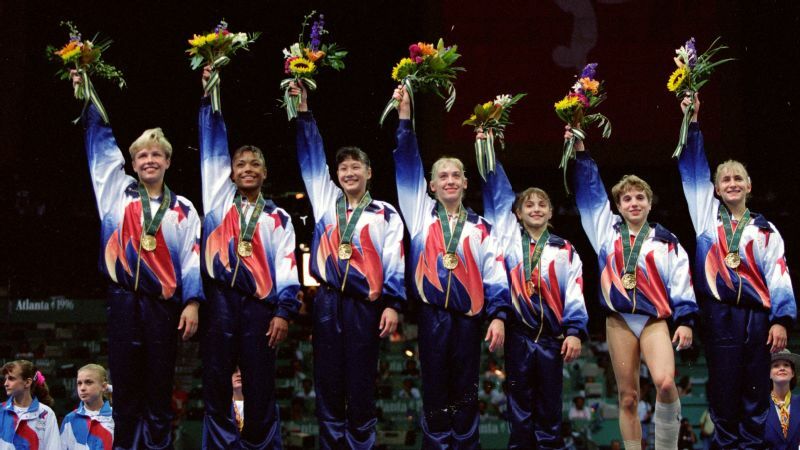 Though Strug's score ends up being unnecessary to win the gold, that technicality doesn't dampen the public's awe over her feat and the enormous popularity of the "Magnificent Seven" team, which also includes stars Dominique Moceanu, Dominique Dawes and Shannon Miller. The U.S. won't win team gold again until 2012, when the "Fierce Five" earned the second women's gymnastics Olympic team title. 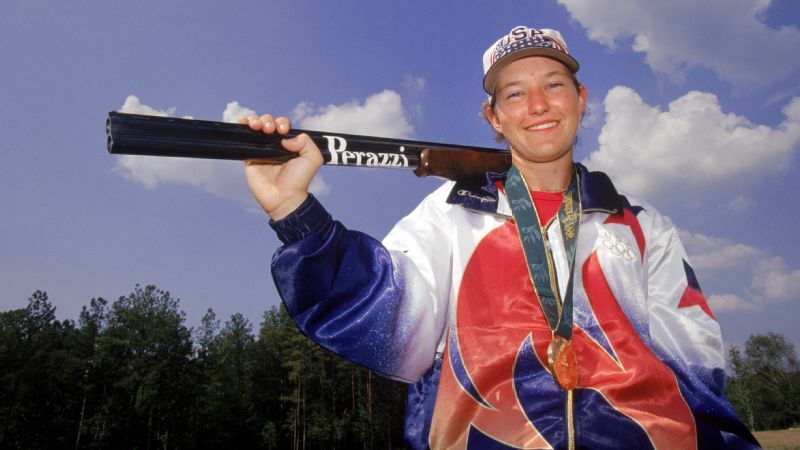 Kim Rhode wins her first Olympic medal, a gold in double trap shooting, just seven days after her 17th birthday. If the charismatic Californian earns a medal in Rio, she will become the first American woman (and fourth woman in history) to claim six medals in six Games. 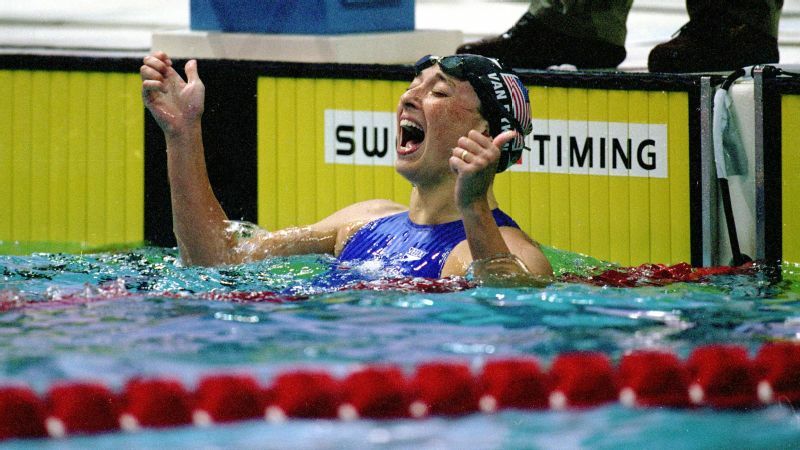 Swimmer Amy Van Dyken becomes the first American woman to win four golds in a single Olympics. After winning the 50-meter freestyle by .03 seconds, she dedicates her fourth gold "to all the nerds out there" who, like her younger self, were tall, gawky and didn't quite fit in. 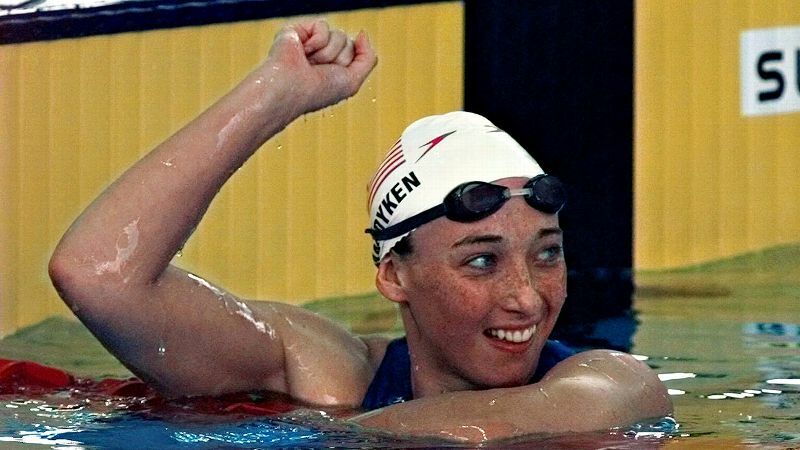 Van Dyken would go on to compete in another Olympics, in Sydney, and win two more golds in relays. Eighteen years later, she became paralyzed when her ATV hit a curb and crashed down an embankment, severing her spine. Afterward, her feisty can-do attitude becomes a beacon to all. A pipe bomb in a backpack explodes in Centennial Olympic Park at around 1:25 a.m., killing one woman and injuring more than 100 people. Security guard Richard Jewell sees the backpack early and saves lives -- but swiftly goes from hero to suspect. He is eventually cleared in October. 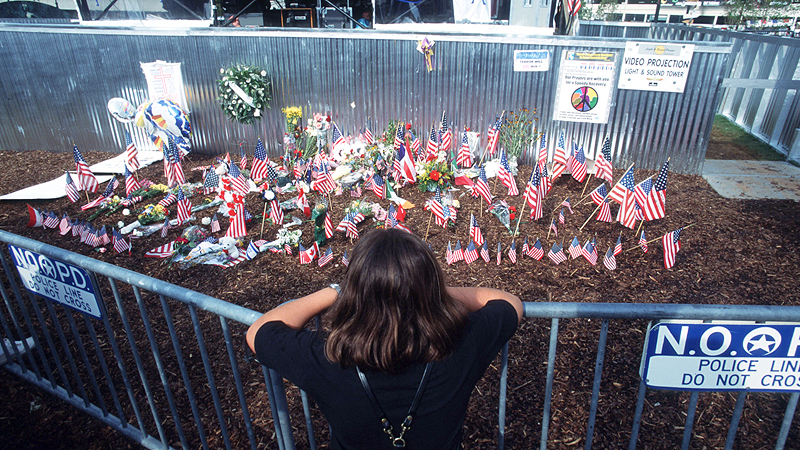 The real bomber, Eric Rudolph, is finally captured in 2003 after a five-year manhunt. In 2005, Rudolph says his motive for the attack was to "confound, anger, and embarrass the Washington government in the eyes of the world for its sanctioning of abortion on demand." Rudolph is currently serving multiple life sentences in a Colorado prison. 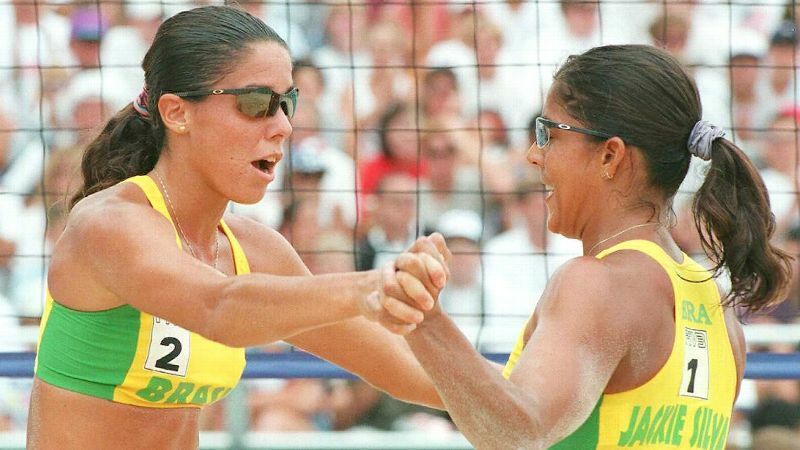 Brazilian women finish 1-2 in beach volleyball's Olympic debut, with Jackie Silva and Sandra Pires winning gold over Mônica Rodrigues and Adriana Samuel. The U.S. has a chance at the podium, but Barbra Fontana and Linda Hanley lose the bronze-medal match to an Australian duo that eventually wins gold in Sydney. From 2004 on, however, the U.S. locks up every gold, thanks to Kerri Walsh-Jennings and Misty May-Treanor. In Rio, Walsh-Jennings will aim for a four-peat with new partner April Ross, a 2012 silver medalist. Deon Hemmings becomes the first Jamaican woman to win Olympic gold. In the 400-meter hurdles, she pulls away from two Americans with about 100 meters to go and wins in 52.82 seconds. 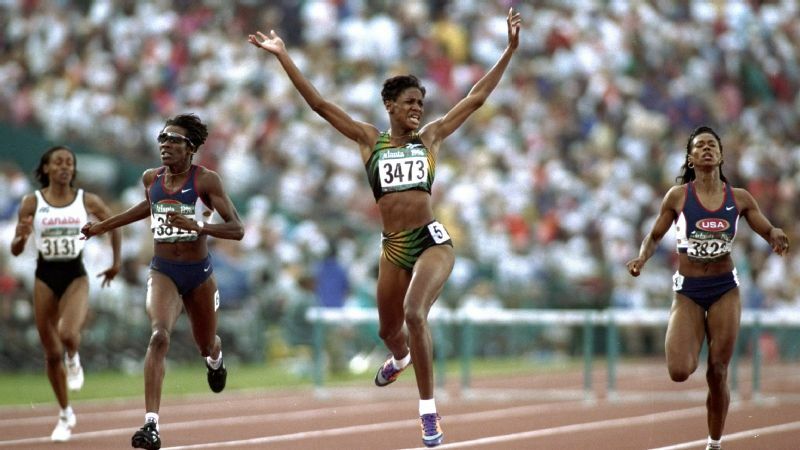 Hemmings competes in one more Olympics, earns two silvers, and carries Jamaica's flag at the 2000 Sydney opening ceremony. From 2004 to 2012, Jamaican women earned six more golds, all in track. The first Olympic gold medal is awarded in women's soccer, to an all-star U.S. team that includes Mia Hamm, Brandi Chastain, Julie Foudy and Kristine Lilly. In the final against China, Tiffeny Milbrett scores in the 68th minute to break a 1-1 tie and seal a 2-1 victory for the U.S. in front of 76,480-plus fans. The U.S. goes on to win every women's Olympic soccer gold medal except in 2000, when it loses the final to Norway. Jackie Joyner-Kersee ends her stellar Olympic career with a bronze medal in long jump. Six days earlier, the 34-year-old had pulled out of the heptathlon with a strained right hamstring, and was unable to go for a three-peat in her best event. 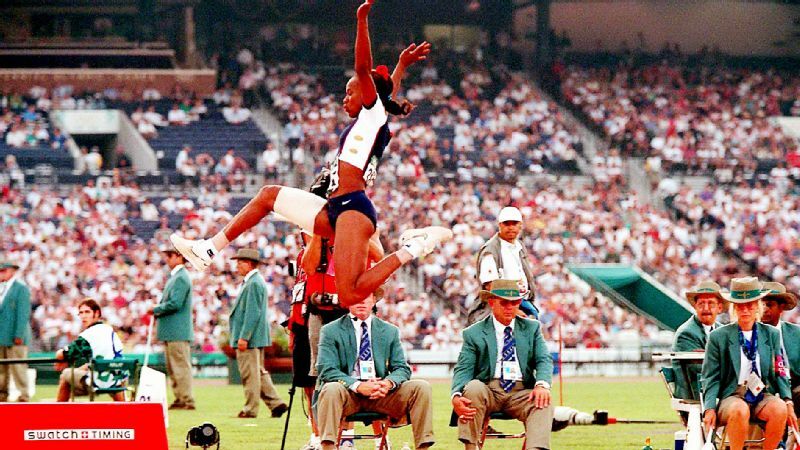 But on her final long jump, Joyner-Kersee leaps from sixth place into third and finishes her career with three gold medals, one silver and two bronzes in four Olympics. Remarkably, "JJK" still holds the world record in heptathlon (set in 1988), and the American record in the long jump at 24 feet, 7 inches (set in 1994). After a 10-month barnstorming tour (backed by seven corporate sponsors and $3 million), the U.S. women's basketball team dominates its Olympic opponents by an average of 28 points and beats Brazil for gold 111-87. Players range from veteran Teresa Edwards (the first U.S. basketball player to compete in four Olympics) to future legend Lisa Leslie to relative newcomer Rebecca Lobo, fresh from her 1995 NCAA title at UConn. 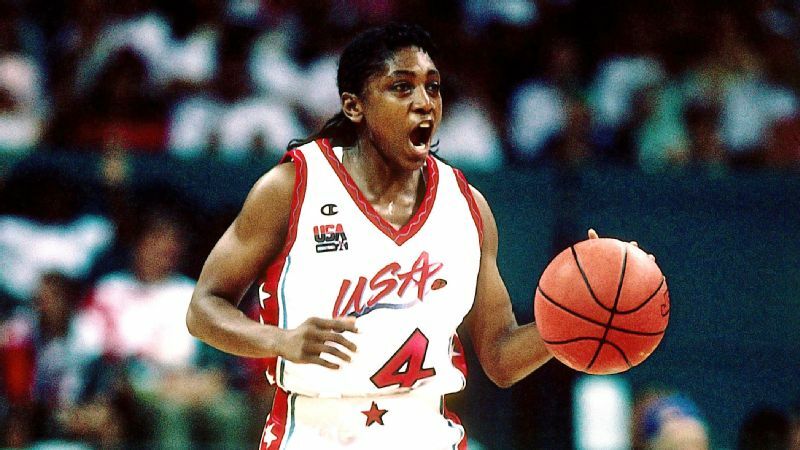 After Atlanta, the majority of the 1996 U.S. Olympic gold medalists -- as well as track star Joyner-Kersee -- play professionally in the American Basketball League. The ABL folds in 1998, but its rival league, the WNBA, remains and is now celebrating its 20th anniversary in 2016.